The aim of this book is to expose readers to architecture’s pretexts that include literary narratives, film, theatre, painting, music, and ritual, as a bridge between diverse intellectual territories and architecture. It introduces a selection of seminal modern and contemporary architectural projects, their situation within the built environment, and their intellectual and formal situation/context as pretexts and design paradigms. Connections between diverse bodies of information will be cultivated along with the ability to posit consequential relationships for the production of architecture. Architecture’s Pretexts seeks to cultivate a vision for architecture that sponsors operative links between the discipline of architecture and those outside of architecture. Exploring the works of various architects including Guiseppe Terragni, Peter Eisenman, Peter Zumthor, Perry Kulper and Smout Allen, and Rem Koolhaas, this book provides the framework to understanding architecture through the lens of art. Key concepts discussed are: allegories, diagrams, form, material, montage, movement, musical ratios, narrative sequence and representation. A valuable tool, with over 75 black and white illustrations, for students and professionals interested in interdisciplinary methods of design thinking. 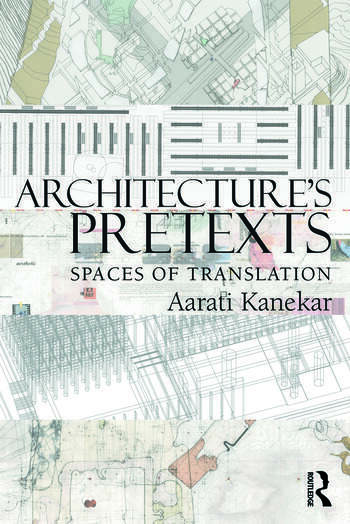 Aarati Kanekar is an associate professor of architecture at the University of Cincinnati. She received her diploma in architecture from CEPT, masters from the Massachusetts Institute of Technology, and Ph.D. from the Georgia Institute of Technology.